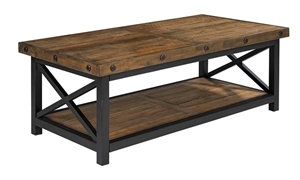 Crafted from reclaimed Rubber hardwood and hand forged metal, this incredible cocktail table is sure to be the highlight of any Rustic or Industrial design. 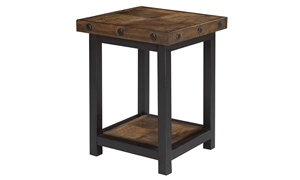 The Timber Forge End Table is the perfect industrial piece, made from solid reclaimed rubberwood on a hand forged metal base. 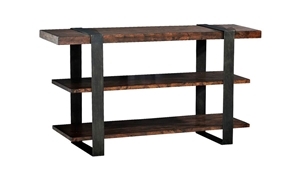 This fabulous industrial three shelf console table is crafted from reclaimed rubber hardwood in a hand forged metal base. 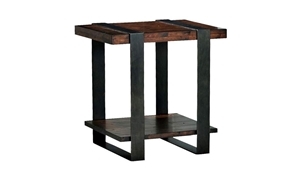 A hand crafted metal base under reclaimed wood and exposed bolt heads make this accent table perfect for any industrial home. 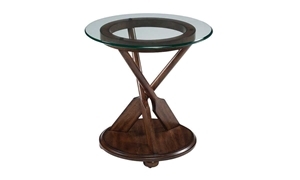 Cocktail table with rich cherry finish over classic lines and a beveled glass top. 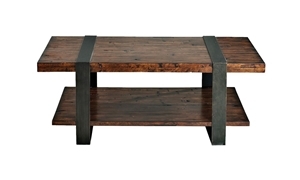 Cocktail table with reclaimed wood top over a hand forged metal base and accented with over sized bolt head details. 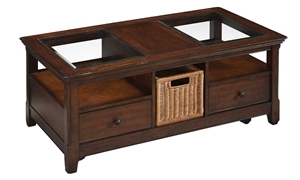 Bring unique nautical flair into any home with this elegantly designed demilune style console table that features a base made up of strategically places oars, finished in a warm, rich stain reminiscent of the interiors of antique Clipper Ships. 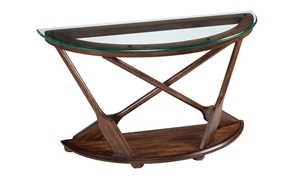 Cocktail table with solid hardwood base in a warm mahogany finish and a thick beveled glass top. 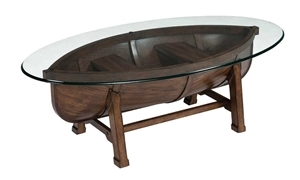 Accent table is inspired by the oceanic vessels of the past, with a base made of three oars, placed perfectly to hold the thick beveled glass top. 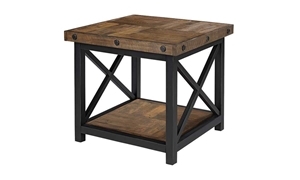 End table with a reclaimed wooden top over a hand made metal base. Cocktail table with shaker stylings and modern convenience. 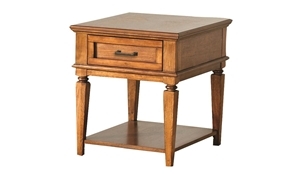 A gorgeous end table that features antiqued oak veneers over solid hardwood. 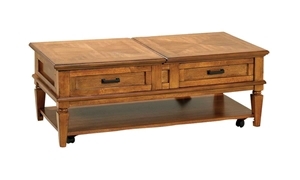 From stunning console tables with lots of storage, to decorative accent tables or coffee and end tables, Haynes Furniture has a fabulous selection for every taste and space.